With the real estate boom creating a high demand for homes, it's important to know precisely what you want so you can jump on the right opportunity. Couples who iron out their home preference differences early in the game often fare better in a low-inventory housing situation. Most people don't think about home-buying compatibility when falling in love. Fortunately, defining your perfect home with your spouse or partner isn't too complicated. Even if one person dreams of a low-maintenance small yard and the other yearns for an acre, it's possible to get on the same page. Of course, the first step is to decide to own instead of rent. SmartAsset named the top 10 metro areas where renting is not as attractive as owning. Louisville, Kentucky took second place as one of the best areas to own a home. Researchers with the financial technology company point out the average monthly mortgage in Louisville, KY, is less than average rental costs. Owning a home versus renting has other serious advantages beyond the financial side. In addition to building wealth through equity, homeowners have more freedom to decorate and no landlords raising the rent or placing restrictions. After choosing to buy a home as a couple, it's time to negotiate, compromise and create a shared vision. While on the house hunt, make separate notes about favorite aspects of the homes to discuss at a later point. Figuring out a budget is not a completely subjective decision. Most couples rely on a mortgage lender to afford a home. A lender will pull credit reports and look at the debt-to-income ratio to determine a specific price range. Make sure to start with a pre-approval letter from a lender to eliminate heartache from growing attached to a home outside the budget. Many millennial homebuyers in their 30s in Louisville tend to skip the starter home because they waited so long to buy. Instead of a home with 1,000 square feet, they want a home with twice the square footage and upgrades. Meanwhile, many baby boomers search for their "final home." Older buyers often have different visions of what their perfect home will look like for their retirement years. Some retirees want to buy a home with cash, while others don't mind carrying a mortgage for 30 more years due to tax benefits. Discuss with your spouse or partner whether you want a starter-type home or a step-up house with upgrades and more square footage. Instead of getting hung up on the finishes such as paint, countertops, and flooring, agree on a floor plan. Many buyers change out the finishes after they buy a particular home. Agreeing on a floor plan isn't just about architectural style but about the purpose and need. Consider privacy needs, flow and the number of bedrooms and bathrooms. Retirees often prefer single-story homes, but even younger families see the need for a first-floor master bedroom when they opt for a two-story home. A main floor master bedroom comes in handy if anyone injures a hip or sprains an ankle. It's also ideal for aging parents that visit or live in the home. When buying a home, remember it's easy and inexpensive to change out the finishes, but sometimes impossible to change the floor plan. When considering location and neighborhood, figure out how far the area is from each family member's school or work. Talk about what matters most to you individually whether it's low crime, top-rated schools or easy walking distance from recreation, nature trails, horse farms or restaurants. If you or your spouse love to bicycle, consider homes near bicycle paths. If your partner wants to stay extremely active at your children's school, look at homes close to your desired school. Buying a home isn't just about financial numbers and square footage. It's also about whether a home speaks to you and how you feel walking through the home. In some relationships, one person is a "people pleaser." A people pleaser will go along with what makes the other partner happy but sometimes regret it later. To avoid buyer's remorse, form an honest impression about each home during a house hunt. Sometimes it's better for people to tour a home with a real estate agent before joining as a couple to view the house. Give the other partner time to make an individual assessment before sharing how the home spoke to you. While there is a lot of room for debate and compromise, most people have non-negotiables or fixed needs that aren't up for discussion. Of course, a real estate agent needs to know your non-negotiables, but it's also important to decide as a couple. Some points include avoiding homes on busy streets, living close to stores, living close to work or buying a home that's newer. If your spouse's non-negotiables conflict with your non-negotiables, it's a matter of ranking the must-haves. Perhaps one person will agree to give up a view of a horse farm in exchange for a short work commute in a home that includes their preferred gourmet kitchen. After settling on the perfect home with your spouse or partner, it's exciting to decorate, pick out furniture and decor. Learning to negotiate and compromise on the big-ticket items such as buying a home often makes it easier to agree on curtains, artwork, and lighting fixtures. At Finish Line Realty, we understand buying a home is an emotional experience that involves getting people on the same page. We're here to help. Request a copy of our full guide below! A free guide to buying property with a partner or spouse. 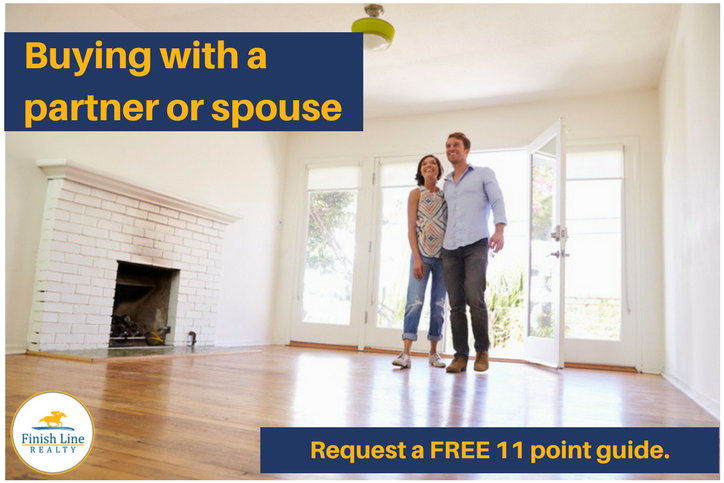 In this FREE 11 Point Guide, we explore the 11 things you MUST KNOW and understand when considering purchasing a home. 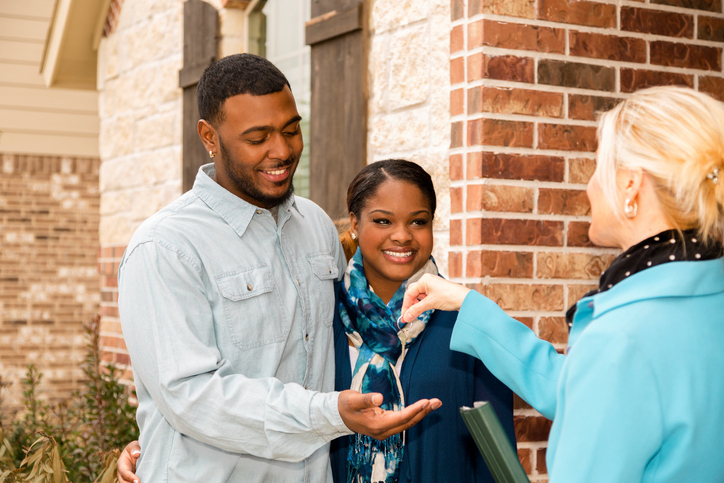 We share the 8 biggest factors in the decision making process to give you and your spouse a framework to discuss before you begin the home buying process. As well as our top 3 tips to reduce friction. Our Home Buying Success Guide will save you time and help you avoid common headaches. Is a formal dining room required? Do you need a first-floor master? Getting real about your budget and mortgage payment.